I say, play your own way. Don’t play what the public wants. You play what you want and let the public pick up on what you’re doing, even if it does take them fifteen, twenty years. Lots going around on pauldbwatkins.com (Riffings) these days. You might have noticed the new look to my website. It’s still a work in progress, but take a look around. The other big news is that I’ve finally finished my DJ project, Dedications. Dedications is an experimental jazzy hip-hop remix project born out of a love of listening to records. The album mixes, mashes, samples, spins, cuts, signifies, rhapsodizes, poetizes, layers, collages, remixes, breaks, distresses, archives, remakes, reshapes, and re-edits pieces of recorded history to create a sonic audio homage to a host of musicians and styles with a nod to the avant-garde. There is a lot of poetry on the album because, as a literary scholar, I have also always understood that poetry is musical, and that music is poetical. Dedications takes various phonogrooves (from jazz, hip-hop, and spoken word, to unusual recontextualized samples) and mélanges them together to create polyvalent dedications to a host of musicians and poets. If you listen closely you will hear William Blake (with Archie Shepp), Sun Ra, Glenn Gould, Pharoah Sanders, Ravi Shankar, Inspectah Deck, Jack Kerouac, Ella Fitzgerald, The Last Poets, Gil Scott-Heron, Charlie “Bird” Parker (with Ontario songbirds), Sonny Rollins, John Coltrane (with Michael S. Harper), Louis Armstrong (with Gwendolyn Brooks), Fats Waller, Earl Birney, the poetry of The Four Horseman, Tom Waits, John G. Diefenbaker, Ginsberg reading Howl over Horace Parlan’s keys, A Japan Airlines record chopped up, Thelonious Monk accompanied by Amiri Baraka, MF Doom, and Mutabaruka dubbing over The Zombies, among a myriad of other sounds, samples, echoes, and cuts. At times I add a live-recorded layer of chant, singing bowl, or beatbox. I played almost all the drums on an MPC, and most of the samples are recorded live from vinyl. If I made a mistake in a recording, I usually embraced it as part of the process. In short, I hope you enjoy the album. It is available for streaming below, or for free download (name your price), here. 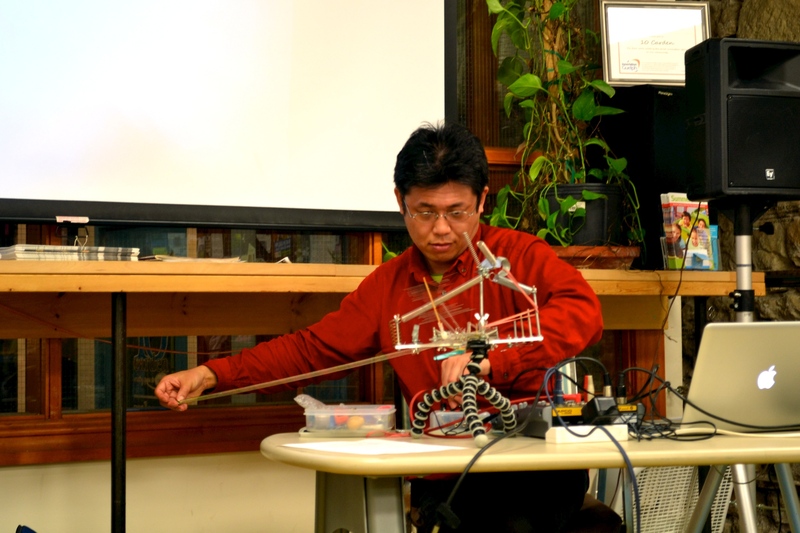 Tomomi Adachi performs on a self-made instrument. Tomomi Adachi (足立 智美) is a Japanese vocal and electronics performer, improviser, composer, instrument builder, installation artist, theatre director, and sound poet. 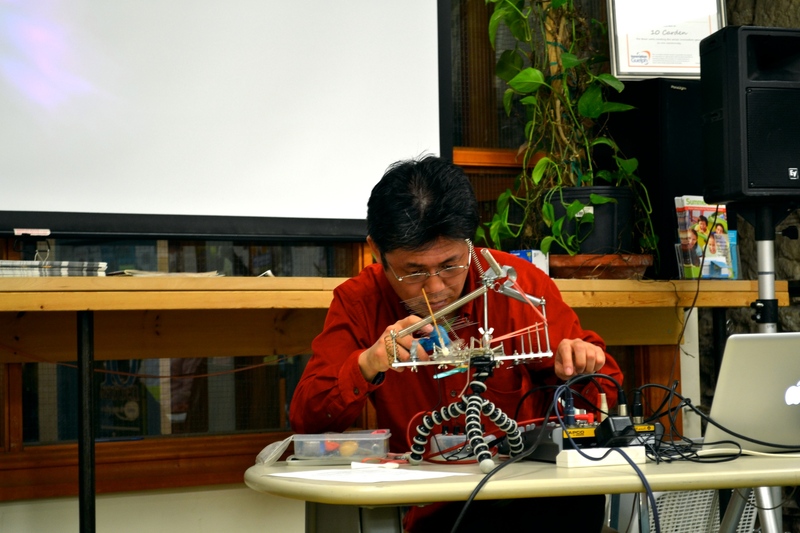 He is the only performer of sound poetry in Japan and performed Kurt Schwitters’ “Ursonate” for the first time in Japan. He has performed with numerous musicians, dancers, and filmmakers, and along with his incredible vocal improvisations, he is known for his unique improvisations on his self-made instruments, many of which are made from Tupperware: a material that is both affordable and portable. Adachi describes his creations as an extension of his improvisatory practice: “I began to build instruments by myself in 1994, it was almost the same period with starting my activity as an improviser.” Last month in Guelph, Ontario we were treated to a performance by Adachi on one of his self-made instruments, as well as a vocal performance, followed by a self-reflexive talk about his artistic praxis. 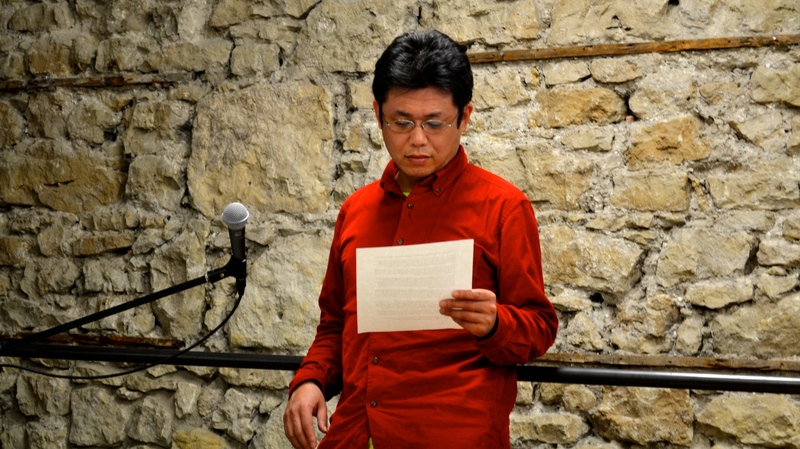 And, here are a couple photos of Tomomi Adachi’s performance and visit to Guelph.